Well, we’ve done it at last. We’ve hit the Big Time. Suddenly the topics that we chat about every day in class – such as concepts of truth and reliability, the nature of “facts”, methods of validating or rejecting knowledge claims, and the dynamic and formative role of perspectives – have come into the glaring public spotlight. Headlines blare out claims about “fake news” or “the war on truth” over British and American politics most specifically, but with fallout that rains down on us all. It’s time for us Theory of Knowledge teachers to take a bow – and then eagerly scoop up for future classes all the new and relevant resources that are being churned out so energetically in the media-sphere that surrounds us. Admittedly, the current public controversy swirling around facts and truth – who has them, who speaks them, who warps them – could create a few problems for us: even uttering the word “truth” in some contexts could potentially provoke the degree of agitation previously reserved for “terrorist”. “Science” and “junk science” have already been politicized to the extent that we can hardly talk about them anymore – let alone teach about them – with any opening assumption that we share a common definition with other people! Maybe, though, our TOK syllabus has just become more fun to teach, with ideas that students can quickly see as relevant to their lives. To treat “fake news” in Theory of Knowledge within the current storm, I’ll offer three tips here, and encourage you to add a comment if you have others to share. 1.Frame the current hot topic with a steady consciousness of our course aims. We want to teach Theory of Knowledge in a way that responds to news and events around us. But we always have to hang onto the knowledge questions and not get mired in the details of the examples. With charges of “fake news” and “lying media” we’re on familiar TOK territory, even if the topic is suddenly livelier in the public sphere. In TOK, as in other IB subjects, we deal routinely with the need to evaluate our sources of information, and to evaluate assertions and arguments for their justifications and their tactics of argument. Current events certainly give us some excellent grounding for plenty of knowledge questions, and we ask them even in quieter times: Does it matter to tell the truth? How do we find the most reliable account of the world in our areas of knowledge and everyday life? 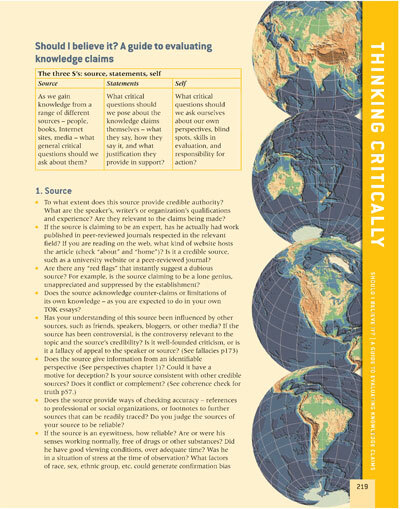 For the ongoing framing of such topics in TOK, I offer two pages taken from my book Theory of Knowledge, with permission from Oxford University Press. They give a framework for evaluation of knowledge claims that I call “The Three S’s: source, statement, self”. I’ve found this approach very useful over years of teaching, focusing an analysis first on the SOURCE of the knowledge claims, then features of the STATEMENTS themselves, and finally, more introspectively, on the SELF who is doing the evaluation. Please feel free to download and use this framework if you’d find it useful in your own teaching. You might find it handy just to keep the over-riding questions at the beginning about each of the three S’s –and encourage your students to identify what issues they’d raise in each category. You can build on it as the course progresses and you hit new topics. The framework on these pages is a finished version of this process. 2. Identify what’s new that needs attention. But is a generic approach to analysis adequate for the kinds of evaluation demanded by the digital age? At a time when the place of truth in public communication has been deeply shaken, we do have to come to grips with the contemporary challenges – and that means identifying what’s new about the flow of knowledge claims and integrating new forms of literacy. The amount of information we are flooded with daily makes it difficult to sort out what’s reliable. These four challenges don’t come separately, and part of gaining digital awareness is recognizing how they work together. As Hornik points out, one major change is the shift in technology, with a profound influence on the sources from which people gain their news. However, the fourth challenge he identifies is not actually a change – human beings have probably always preferred information that supports their beliefs. What’s changed is our understanding of how our minds work. We have become increasingly aware of our own cognitive biases, notably confirmation bias, as the cognitive sciences have studied the way people deal with claims that contradict their beliefs. (TOK WOK intuition) The combination of technology and our intuitive biases, exacerbated by the algorithms of such sites as Facebook, has created a dramatic contemporary version of the bubbles of belief within which we live. You might find it relevant to glance back at my post from November 21, 2016, “Thinking beyond the knowledge bubbles”. Beyond the issues of bias in the media sources and bias in our own minds, though, our present day gives us an additional challenge – reports that are outright lies but which feed our biases and spread on current technology at viral speed. (e.g. Pope Francis did not, in fact, endorse Donald Trump. Fake news!) In TOK, we recognize that identifying “facts” can be surrounded by issues of judgement. (You may want to read the article on “The Epistemology of Fact Checking” by Uscinski and Butler, listed at the end.) Yet no ambiguity surrounds some of the stories circulated on the internet that are factually false. There seems to be no solution, ultimately, that replaces human judgement. We need to be critically alert ourselves. 3. Help students develop relevant skills. And so, what are the new skills that our students need to face the challenges of fake news in a digital age? Concerned that I was being bypassed by some of the current means of communication, I recently audited an online course on media literacy offered by Stony Brook University. Then, after wandering labyrinths of links through hundreds of good articles and videos, I’ve picked out three sources that I would most highly recommend for Theory of Knowledge. 1. The first is a splendidly TOK-relevant article in the blog “Neverending Search” written by Joyce Valenz of Rutgers School of Information and Communication: Truth, truthiness, triangulation: A news literacy toolkit for a “post-truth” world”. She writes for librarians, who are natural allies of TOK teachers in holding the overview of knowledge, thinking critically about “shared knowledge”, and evaluating sources. Valenza pulls together central issues in an impressively compact and lucid way in this article, which also bristles with links to further resources. 2.The second is a set of lesson plans for teachers, updated in January 2017, from the New York Times: “Evaluating Sources in a ‘Post-Truth’ World: Ideas for Teaching and Learning About Fake News” I wouldn’t suggest simply following these lesson plans: they’re too time-consuming for TOK, and they’re too heavily American in their examples for those of us keen to resist being sucked down into this national news vortex. However, the site is useful in drawing critical distinctions, providing real life examples, and suggesting activities for students. All of these are applicable to the internet and digital media. 3.The third is a goldmine for teaching digital media awareness: the Digital Resource Center of the Center for News Literacy. It offers (free) a series of 14 lessons which deal directly with questions we raise in Theory of Knowledge. Do have a look through its 2017 syllabus outline: News Literacy syllabus. Again, it’s American in its media context and examples, and is far too detailed for TOK. However, you’ll probably find within this material some useful approaches to analysis and effective examples. If you followed all the excellent links and suggestions in these resources, you could get lost in there. I certainly felt overwhelmed myself. I had to leave the screen for a couple of days, in order to pull back and regain some of the distant vision that we practise in TOK. I also had to remind myself of the practical limitations of time. This set of questions is a supplement to those given in the pages excerpted above from Dombrowski, Rotenberg, and Bick, Theory of Knowledge (OUP, 2013), 219-220. The questions below apply to websites and digital media. What features of the domain name give an indication of its reliability, or of its status as a news site, blog, or the website of an organization? 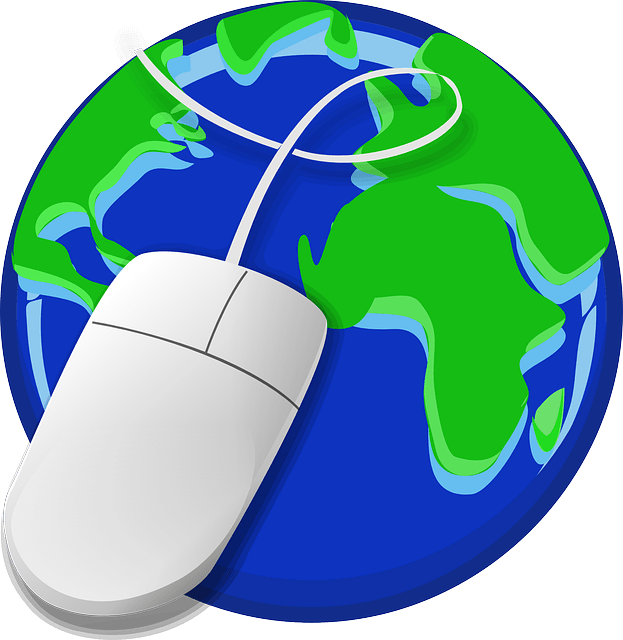 What does the suffix of the url (.com, .org, .edu?) indicate? Does the domain give accurately the name of an identifiable organization in conventional format, not a “look-alike” name and/or additional suffix (e.g. Note the added suffix: abcnews.com.co)? Does the website provide background “About us” and contact information? What can you learn by googling the domain, the writers, the organization – possibly about political affiliation, reputation for reliability, or identity as a satirical site? (useful: wikipedia, Snopes, FactCheck.org)? Is there a “disclaimer” that denies responsibility for the content? Are other sites, including known and reputable ones, covering this topic and making similar statements? Can you check quotations and details with other sites, by googling? Do the sites seem to be independent from each other in what they report, or do they echo another source site or each other? If studies are cited, can you find the original source of the information in order to evaluate it? Does the website look amateur in design? Does it use lots of CAPITAL LETTERS, bold headings, banner ads, and pop-ups? Does the headline fit the story that follows it? Do sensational statements or unlikely promises (click bait!) tempt you to follow the links, on reflex? Do the statements make you indignant, angry, fiercely patriotic or otherwise emotionally aroused about an issue on which you’re not already informed, then suggest actions (e.g. signing petitions, sharing a link, downloading material, donating, voting in a particular way, buying a particular product)? Does an inflammatory article give you sources of information, evidence, and “facts” that you can check? Is there any indication that an article (e.g. on Buzzfeed) is a sponsored link (look for acknowledgement in top corners), probably an ad presented in the same format as news? Do you care if what you accept online what you share with others, for instance via Facebook, is true? Why does, or doesn’t, it matter to you? Are you patient with breaking news, aware that early reports, posted quickly, are more likely to have errors than later, more verified ones? Under what circumstances do you share posts to pass on to others reports or images you’ve received on Facebook, Twitter, or other forms of social media? On reflection, what guidelines would you give yourself in order to be on guard, in a tempted moment, against passing on false “news”? On Facebook, does the news posted by friends, or appearing in sponsored space, always support your own point of view? If so, which is more likely: that you’re consistently right, or that you are insulated from alternative views? Do you have a media-reading strategy that includes a range of sources you have carefully judged reliable across a political spectrum? Do you actively seek out news and evaluate it, and select and sign up for newsletters and feeds on topics on which you want to stay informed? If you would find this set of questions useful, please feel free to download it and use it in class, with the usual conventions of acknowledging the source. It would be easy for our students to tune out – to feel that no politicians and no media are to be trusted, to reject all of them equally en masse, and to turn their attention away from engagement in the issues of their societies. Many commentators insist, in fact, that attacks on the media have exactly this purpose: to confuse the public on the facts so that, not agreeing on what’s true, they won’t take collective action. The recent storms over “fake news” are today’s version of a longer term manufacture of doubt on major issues of science. As we consider “shared knowledge” in Theory of Knowledge, we have to recognize the problems in how knowledge is shared. Students maturing to awareness of their society at this point risk being drawn into what’s being called a “post-truth” era: the Oxford Dictionary made “post-truth” their word of 2016 not because truth had ceased to exist, or had become inaccessible, or had been treated as inevitably contestable – but because it had so notably been sidelined as significant for political decisions. So what do we do about it, as TOK teachers? First, I’d say, we have to refuse to get discouraged ourselves. And then – I think we want to engage our students in some fascinating detective work! Building reliable knowledge (as well as we can) is not a passive activity. It demands active searching and sleuthing. It demands steady development of critical skills in everyday life just as in the methods of areas of knowledge. And that’s what we can give our students in TOK – awareness and skills. The current political climate just makes our teaching more obviously relevant than usual to everyday life, and possibly more fun. Thank you very much for sharing great tips and specially downloads that will be best to understand and follow different methodologies to get rid of fake news.